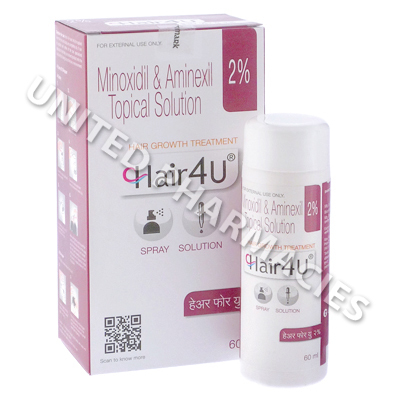 Hair4U (Minoxidil/Aminexil) is used to treat male hair loss, including male pattern baldness (androgenic alopecia). It works by invigorating the hair follicles, energising them, and speeding metabolism. In addition it is an antioxidant which helps to prevent free radicals from causing damage to the scalp, while additionally fighting bacteria and blocking DHT formation. This medication is most effective during the early stages of baldness. It can be used over both short and long periods of time depending on your needs. In order to see the results of the medication, the minimum recommended period of use is 3 months. Strictly use Hair4U (Minoxidil/Aminexil) as you have been prescribed by your doctor. To administer, simply apply a small amount directly to the balding area and massage into the scalp. For best results you will usually be advised to do this 2 times per day, for at least 3 months. Always wash your hands using soap both before, and after application. After around 1 month of use you may feel you are losing hair and the medication is not working. This is entirely normal though and the hair being lost is old hair being replaced by new hair. Please note that when patients stop using this treatment they may return to their previous level of baldness. This is usually exclusive to patients whose baldness is hereditary, but can occur for any patient. Report all side effects which you notice while using Hair4U (Minoxidil/Aminexil). Do so as soon as possible if any persist, worsen, or become bothersome. Patients may experience irritation or redness. Other possible side effects which are rarer in occurrence include low blood pressure and palpitations. If you suffer an allergic reaction, seek immediate medical attention. Possible symptoms could include skin rashes, hives, swelling, chest pains, difficulty swallowing, and trouble breathing. Protect your scalp from direct sunlight as much as possible while using this medication to avoid aggravating scalp irritation. If you suffer from any other existing medication conditions or illnesses, especially any skin related conditions. If you are using any other medication (including all off-the-shelf medicine). If you are using any dietary supplements or herbal products of any kind.